« Stitches West…..So much fun! breakfast and the knitting market are calling! I began waking around 4:30 a.m. without the dog or cats to help…just excited about the new day ahead…friends and yarn were on the horizon. 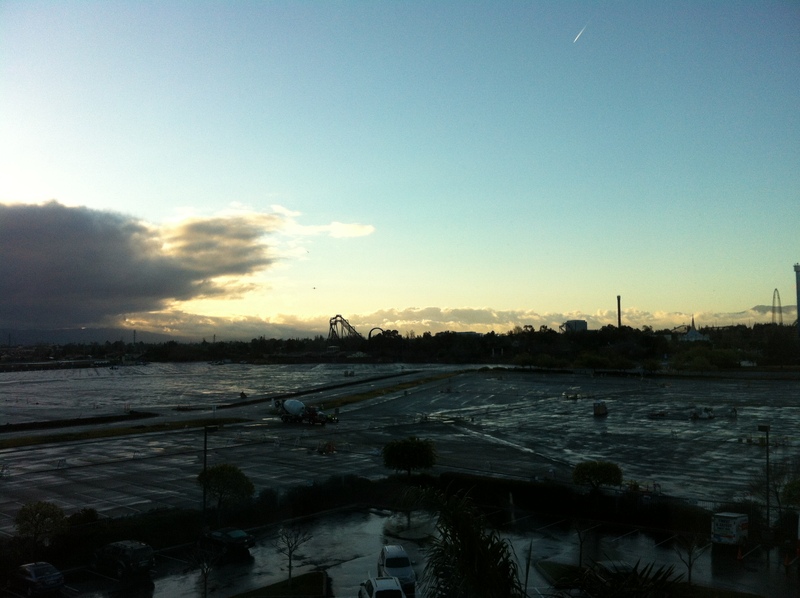 I must confess I really am not the best hotel person…don’t like them for lots of reasons. I laid low until 6:00 a.m. …did not want to include my great roommate Karen H in my wake-up world. The truth of the matter is I kept sneaking peaks at my iPhone to see who was up and what was going on. It wasn’t long before Karen and I were both up and talking…sorting out the day when the text messages from the group of 10 others starting flowing. Who was up…what time to meet for breakfast…should we meet in our hotel dining room. It was all too funny! My sister Betty (from Fremont) joined us for breakfast at the hotel…she and I had planned to meet for the day…and we added this breakfast delight to our plate! Breakfast done…we all moved onto Stitches….what a great entrance for me. Right off the bat, I saw one of my old Skein Lane knitting friends Alice (we are now FB friends)…that was the beginning of more wonderful “reunions”! One of the unique joys is that we are all so happy to meet….and yet we want to keep it ever so brief….the market is waiting! Betty and I spent 5+ hours on the market floor. Many of you may not know that I really hate to shop except when it comes to knitting….I can get so lost in it. I saw many old friends….was inspired by many knitted items and hardware type stuff….and walked away with a couple of new things. I know….we all know….I did not need a thing….but that doesn’t matter. I am a knitter and we buy for further creation! Some of my favorite stops along the way of 191 booths were Village Spinning & Weaving….John always has a huge line in his booth; Belisa Cashmere…..a wonderful vendor from one of my three homelands….Australia; Cabin Fever and Sheldridge Farm…..Lyn (Cabin Fever) is one of the Gemmel sisters of top-down knitting design …… these two companies have recently merged together. I bought here….yarn and pattern for lovely long vest. 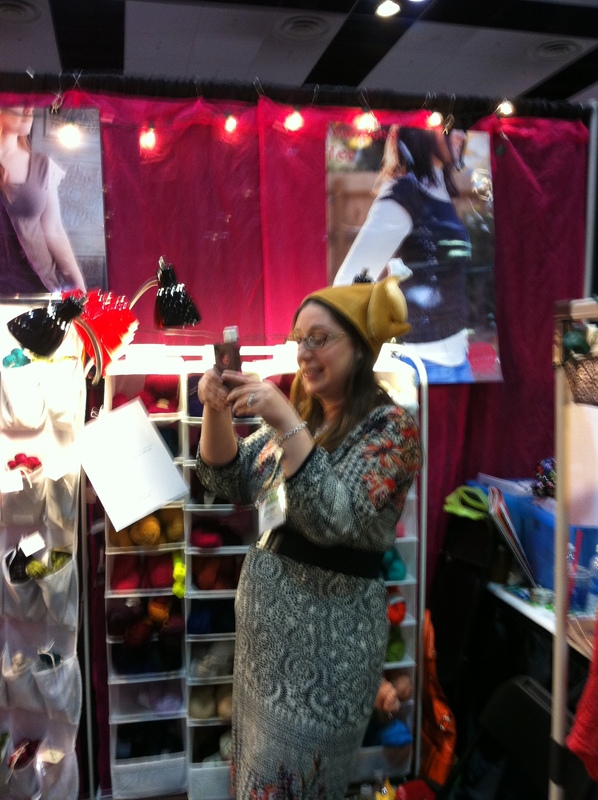 In another booth…Dan Doh Knit and Crochet Designs I found a V-neck sweater design that I had to have. Okay….how many sweaters do I really wear because I am generally warmer than the average person….but it is V-neck and I can knit it in cotton. We then stopped at the FoxyKnits where I bought a lovely shawl pin. I love to see Knitterly at Stitches….this shop from Petaluma has the best yarn choices, customer service….and great charm abounds! Of course, we stopped by MaggiKnits again…wanted to show Betty the many choices an I wanted to revisit. We then headed over to Fickle Knitter’s booth….Michelle and Kimberly not only showed lovely yarn and garment models…but entertained us with a dance. There were several vendors that I did not spend time with and I wanted to…..Nifty Thrifty Dry Goods. This vendor has such interesting novelty accessory offerings….I could get lost in that booth for at least an hour…maybe that’s why I didn’t…felt like we needed to keep moving. I can hardly believe I didn’t stop in at Lisa Souza Knitwear and Dyeworks..…Lisa has wonderful hand-dyed yarns…I’ve knit with many…..I’ve been a customer of hers since my pre-retail days and her days of selling at Live Oak Park in Berkeley. Her booth was busy when we walked by and my plan was to return….but I got finally got the “knitter glaze” of being done with seeing too much….loving it but could not comprehend anymore. It was then time for Betty and me to move out and head for home. Another vendor that I missed was A Verb for Keeping Warm. Their booth was in the last aisle and my head was turned the wrong way. Ugh! Luckily, this is a local shop for me and I will visit there soon. Wait…..there’s more. 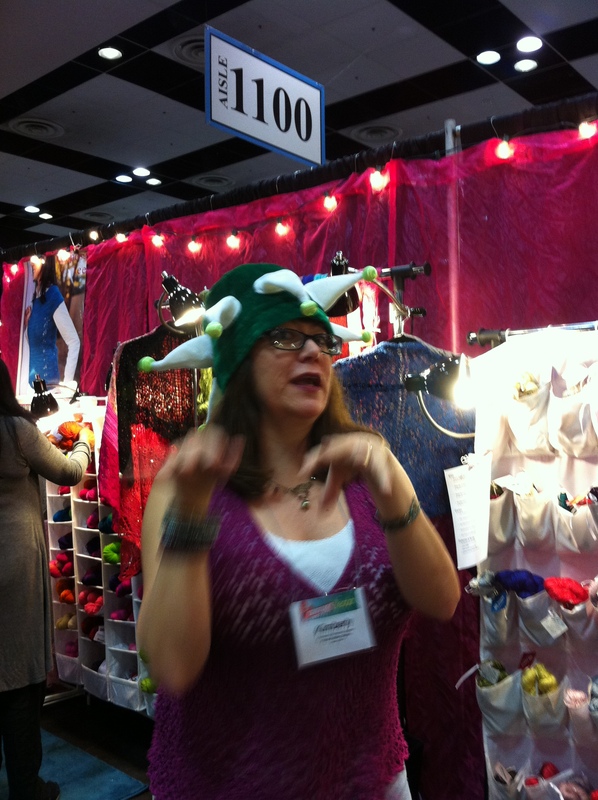 I got to see two of my favorite people – Melissa Leapman mid-day Friday…she had taken a break from her teaching and came to booth #713 – Leilani Arts to help out….this booth was directly across the aisle from MaggiKnits. Yeah for me….I love her teaching and designing skills….and best of all I think she is such a great person. I always love to see her and she was the last Stitches person I saw that day. In the middle of the afternoon I was able to chat with Lorna Miser….another lovely person…teacher and designer. In case you didn’t get to see the photo album that I posted on Facebook Sunday….here’s the link! Truth be known….I really did entertain the thought about going back to Stitches on Sunday. I do love yarn and the world around it! But….I stayed home and tended to the garden. Now back to knitting! Karen H modeling a consideration..she didn’t get it! The Market Floor before the throngs! Carolyn, I love your writing and I loved chatting with you last weekend– always a pleasure! Hope to see you soon! Rachelle…thank you for such lovely comments. So glad our paths have crossed and connected. Based on your question the other night re: Skein Lane history you’ve inspired me to start writing the Skein Lane story…Karen king and I talked about this idea when I closed the retail shop. it’s time. Thank you! Likewise, about our paths crossing! 😉 And… yay for the the Skein Lane story… I can’t wait! A preliminary report from Stitches West. Carolyn is my knitting teacher – I would never have heard of Stitches without her. Some of my fondest Stitches memories are working for her in her booth when she owned the great Skein Lane, El Cerrito’s LYS. Alas, those days are gone. ANYHOO – I was at Stitches West with Miss C and here is her take on the show. Stay tuned for mine – I AM STILL RECOVERING (as you can see from my picture in her post). You got up at 4 a.m.????? YOU ARE A BUTTHEAD!!!! No, not really, but REALLY????? And that’s all you bought??? Can’t wait til Friday’s show and tell. K…you are too funny…I woke at 4:30 am…grabbed my iPad (thinking of you) and “read” it under the covers. Karen H never knew!! Looking forward to the show and tell on Friday.